To our readers: We do not often reprint other newspaper editorials, but I felt that the commentary below which ran Tuesday in The Observer encapsulated the essence of what may ultimately become the most dangerous deal since the appeasement of Hitler in 1939. Given the sudden flurry of contradictory and get-tough statements made in the last 36 hours, no one can be 100 percent certain that a final deal will be made. 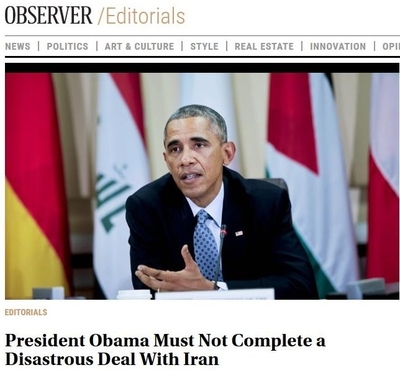 On the other hand, as the editorial points out, President Obama's "obsession" with negotiating an agreement with Iran has resulted in his making such irreversible concessions that Iran will find it impossible to refuse to come to terms. Yet it is those very concessions that lie at the heart of the matter. Because the president seem blind to the collateral damage of such a deal that would threaten the very survival of Israel and the very security of the West itself. With the US on the brink of signing an agreement that will lift the crippling economic sanctions on Iran in exchange for alleged guarantees that Iran will limit its nuclear ambitions to peaceful means, the Observer urges President Obama not to place his personal hunger for a legacy issue ahead of his most solemn duty – protecting America's national security. Barack Obama has been compared to British Prime Minister Neville Chamberlain , who concluded the ill-fated Munich Pact with Hitler in 1938. But Chamberlain acted out of a sincere belief that he was avoiding a greater evil. Chamberlain was not thinking of his place in history. He was thinking only of the Britain that he loved, a Britain that was all but disarmed, exhausted, and vulnerable. He was dealing with a nation that had been decimated by the Great War, a nation whose "best and brightest" five years earlier had declared in the infamous Oxford Oath that they would not fight for king or country, and a nation that was as materially unprepared for war as Germany was prepared to fight. Chamberlain dealt from a position of weakness, one that Hitler continually exploited in the negotiations, even by changing the time and place to make it more inconvenient for the British leader to attend them. In sharp contrast, Mr. Obama is acting out of personal aggrandizement. He believes he is replicating President Richard Nixon's historic opening of China. For Mr. Obama, the Iranian nuclear arms deal is about his place in history. Mr. Obama is dealing from a position of strength that he refuses to use. The sanctions have hurt Iran. Falling oil prices only add to Iran's vulnerability. Instead of using the sanctions to pursue his original promise that Iran would not get the bomb, Mr. Obama has moved the goal post. Iran would not get the bomb immediately. It would be permitted to enrich uranium well beyond the 5 percent need for generating nuclear energy and be left with a breakout capacity to create a bomb. Meanwhile, Iran is refusing surprise inspections, the hallmark of any such agreement, and has ruled its military facilities, such as the enrichment plant at Fordo, off limits to any inspections, period. Iran continues to showcase public displays of Israel being obliterated by an Iranian nuclear bomb, and even in the midst of negotiations government-orchestrated mass rallies cry out, "Death to America." If Chamberlain possessed America's strength and was dealing with Iran's weakness, would he be negotiating as Mr. Obama is? Would he be more concerned about a Jew building an extra bedroom in Jerusalem than an Iranian building a bomb at Fordo? History has debated whether Chamberlain was the reckless appeaser that he is stereotyped as or the man who dealt from a position of extreme weakness against a foe he was unprepared to go to war against and who sacrificed part of Czechoslovakia to buy Britain time to rearm. Even Churchill, who filleted Chamberlain with his famous "choice between war and dishonor and now will get both" zinger, understood that Chamberlain was acting in good faith and kept his vanquished predecessor in his War cabinet. Mr. Obama is an amateur who is enthralled with the sound of his own voice and is incapable of coming to grips with the consequences of his actions. He is surrounded by sycophants, second-rate intellectuals, and a media that remains compliant and uncritical in the face of repeated foreign policy disasters. As country after country in the world's most dangerous region fall into chaos—Libya and Yemen are essentially anarchic states, even as Syria and Iraq continue to devolve—Mr. Obama puzzlingly focuses much of his attention and rhetoric on Israel, childishly refusing to accept the mandate its people have given their prime minister in an election that, by the way, added three additional seats to the country's Arab minority. We can debate whether we should ever have been in Iraq, but Mr. Obama's hasty withdrawal to make good on a campaign promise created the power vacuum filled by the Islamic State. In Syria, he vacillated over the enforcement of red lines and whom to arm. There too, he created a vacuum filled by the Islamic State. The deal with Iran follows in the wake of these foreign policy disasters. Among our traditional Sunni allies in the region, it is seen as a betrayal not simply because it advances Iran's nuclear ambitions but also because it encourages Iran's support for the Houthi Shiite militia in Yemen and Iran's adventurism in Iraq. The lifting of sanctions means more resources for Iran to transfer to its meddlesome proxies like Lebanon's Hezbollah, the assassin of Lebanon's democratic aspirations. The nuclear deal gives Iran an unacceptable nuclear umbrella that will compel the Gulf State Sunnis to launch their own nuclear programs, setting off a disastrous proliferation in the region. The Iran deal is a march toward the nuclear abyss hand-in-hand with the world's largest exporter of terrorism– the patron of Hezbollah, Hamas, Houthi militias in Yemen, Shiite militias in Iraq, and operatives killing Jews in Argentina. Regrettably, a naïve, petulant President Obama sees this as a crowning part of his legacy and nothing will stand in his way. Until Mr. Obama released a 1987 classified report detailing Israel's nuclear program, we believed that the president's Iranian policy was motivated by a different vision of America's interests in the Middle East. Admittedly, it is one that would be difficult to dissect, let alone to explain. But Mr. Obama's latest petulant act shows that this is not a president motivated by policy but by personal feelings. He sacrificed the security of our close ally and its seven million citizens because he felt slighted. How else does one explain that Israel's nuclear program is made public while the report's description of the programs of our NATO partners is redacted? We might call for Mr. Obama to find his inner Churchill and walk away from this tragedy, but we would be happy if he would simply find the character of the "real" Neville Chamberlain, who when dealing from a position of America's strength would never have signed a deal with the devil. Ultimately, this deal will come back to haunt Mr. Obama's legacy far more than Munich haunted Chamberlain's. As bad as Obama and his administration is with all the damage already completed the real loss for America is that of the media whether TV, Newsprint, or magazines to be truthful to this country. Once the giant awakens and sees these supposed news organizations for what they really are there will be hell to pay for all their lies, deception, misinformation, and biased reporting. Obama administration's secrecy and lies. Everything this administration does makes me angrier and angrier. President Obama has deliberately ignored what he is supposed to be achieving with Iran. But considering influences like CAIR and ISNA and Valerie Jared which are largely dictating his policies, I'm really not surprised. He has proceeded on the assumption that he must have an agreement with Iran even if he has to do it with no oversight by the Congress or the general public and even if it amounts to little more than a surrender document. Obama wants Iran to assist with the efforts to defeat ISIL, but that is a huge mistake. Both groups have substantially the same goals with respect to what they want to achieve with Israel, the USA, and Europe. Both support mass killings to impose their religion on non-Muslims. Both support the murderous brutality of sharia law. Both want to expand their power to a worldwide Islamic dictatorship. Your editorial implies that President Obama is out of his league and is floundering. That is most generous. In fact, the President is highly intentional in fulfilling his mission of leaving the United States crippled and Israel under existential threat by the time he leaves the White House. All his actions have been decisive in that direction and his pique is that the Republican Party and the State of Israel have the audacity to oppose the fulfillment of his plan. Steve, Right on and well done!